We all experience inflammation; it is certainly common enough. The term refers to the response of cells in the immune system to infection or tissue damage, but also to the pernicious kind of stress that comes with our high anxiety life styles (see Stress in America). When chronic or excessive, inflammation can damage healthy tissue, including the nervous system. We know a little about the threat inflammation poses to brain function, but less about how the brain exerts control over the response. Since inflammation causes pain and increases the risk of depression and dementia, I’m motivated to ask what I can do to limit the dangers. Part of the answer lies in making a conscious effort to improve “vagal tone”. Let me explain. The pharmaceutical industry focuses on drugs to reduce pain, witness the wide variety of NSIDs and opioids and the resent interest in marijuana directives. However, a completely different approach, one that does not involve drugs, is based on the powerful role the nervous system plays in modulating immune responses. 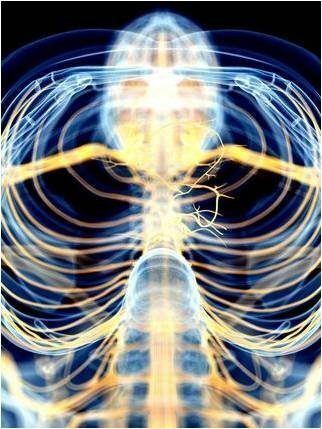 The vagus nerve (VN, the wandering nerve) is a principle component of the parasympathetic nervous system. It extends from the brain stem to every organ in the body and it both monitors and controls organ function. Activity in the vagus nerve is measured by what is called “vagal tone”. Healthy vagal tone is indicated by a very slight increase in heart rate when you inhale, and a decrease in heart rate when you exhale. An elevated vagal tone is linked to physical and psychological well-being. Low vagal tone is associated with depression, negative moods, loneliness, heart attacks, and stroke. Clearly maintaining healthy vagal tone is a good idea. A study of people suffering from rheumatoid arthritis illustrates the role the VN plays in controlling inflammation. Stimulating the vagus with a small implanted device, similar to a cardiac pacemaker, to increase vagal tone reduces inflammation and improves outcome for these people. Importantly, the improvement is accompanied by inhibition of cytokines, molecules that drive inflammation by overstimulating immune cells. The full article is here. The point is that the brain can directly modulate inflammation elsewhere in the body via the vagus nerve. This is referred to as “the inflammatory reflex” and it occurs when activity in the VA releases the neurotransmitter acetylcholine from its terminal branches. This in turn inhibits production of a number of immune cell activators associated with inflammation and lessens the immune response. You will find detailed discussion of the inflammatory reflex here. What about the much more common joint problem, osteoarthritis (OA)? Unlike rheumatoid arthritis, OA is not an autoimmune disease, is comparatively low-grade, and is mediated primarily by the innate immune system. For the longest time, OA was viewed as a degenerative disease of cartilage, but it is a disease of the whole joint, involving breakdown of cartilage, remodeling of bone, formation of ectopic bone, hypertrophy of the joint capsule, and inflammation of the synovial lining. Moreover, inflammation is at the root of the problem. Current treatments for OA only address the symptoms, and none are approved for prevention or slowing disease progression. However, new insights into the inflammatory cause of OA hold promise that the vagal inflammation reflex could represent a route to therapy or possibly even prevention. Because managing inflammation is so important to health, we need to learn how to go about it. As a starting point, it is well known that reducing anxiety and “fight-or-flight” responses serves to reduce pro-inflammatory markers for stress in the brain. One way to achieve this is through daily habits like yoga and meditation, and it really helps to simply avoid negative people. Deep abdominal breathing—with a long, slow exhale—is a great way to stimulate the vagus nerve and improve vagal tone through its innervation of the diaphragm muscle. This is the foundation of Pranayama, or yogic breathing. Check out Stacey Schuerman’s excellent TED talk for more on this (Breath — five minutes can change your life). Also, there is a more thorough Neuromavin post about breathing, Breath Yourself to Sleep. Physical exercise can decrease inflammation throughout the body, evidenced by reduction in C-reactive protein, when done correctly which means in moderation. That much is known, but how to identify the correct exercise routine is a controversial topic. Here is a place to start. There appears to be a self-reinforcing connection between positive emotions and physical health, one that is mediated by one’s perception of their social connections. Researchers at UNC tested this in a nine week experiment in which people were assigned to one of two groups. Group 1 practiced loving-kindness meditation as a way to form a positive group experience while group 2 was a waiting-list control group. Those in group 1 showed increased positive emotions relative to those in group 2 and they also exhibited increased vagal tone. The authors concluded that positive emotions, positive social connections, and physical health influence one another in a self-sustaining feedback loop involving the VN. Other findings also support a role for the vagus nerve in mental health. For example, direct stimulation of the VA is used to treat severe depression, apparently by activating circuits in the brain that affect mood. I wonder if the increase in vagal tone that occurs with social interactions is linked to decreased production of pro-inflammatory cytokines. There is some evidence from clinical studies suggesting this might be the case. Stress and depression are associated with activation of the immune system, including increased cytokine levels. Also, when administered to patients, cytokines produce symptoms of depression while pharmacological block of cytokine receptors reduces symptoms. Finally, an analysis of all of the studies that used gene expression data to examine effects of mind-body interventions (i.e., mindfulness, yoga, Tai Chi, breath regulation, etc.) found that the expression of cytokine genes was down-regulated, specifically NF-κB-targeted genes. The author’s interpretation is that their finding “…can be understood as the reversal of the molecular signature of the effects of chronic stress”. A consistent story is beginning to form. So far just a theory, but suppose the good feelings generated by exercise, yogic breathing, meditation, the company of positive people as well as the neuro control over inflammation all have the same origin, activation of the VN to increase vagal tone. The great thing is that if this pans out, the whole set of wonderful benefits is available to us at a conscious level and only requires a little will power.